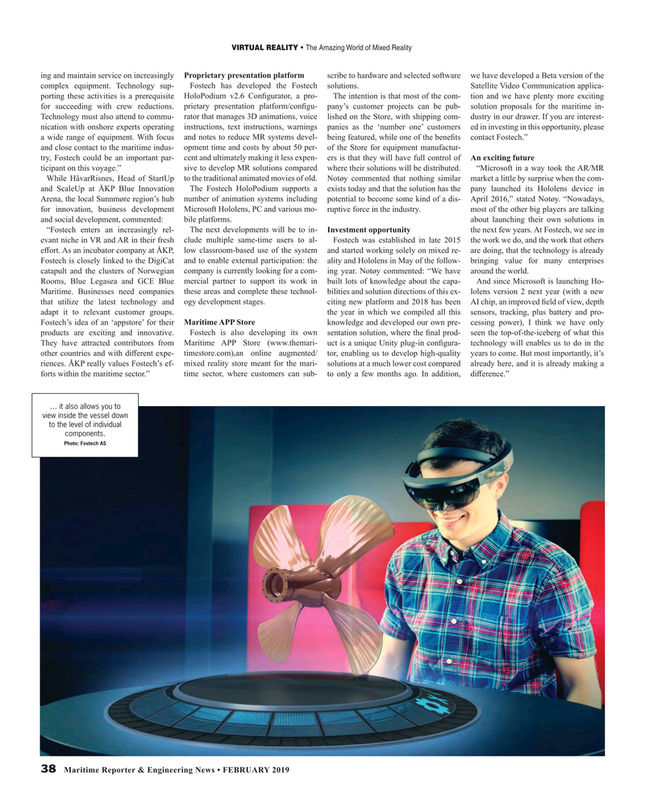 Fostech is closely linked to the DigiCat and to enable external participation: the ality and Hololens in May of the follow- bringing value for many enterprises catapult and the clusters of Norwegian company is currently looking for a com- ing year. Notøy commented: “We have around the world. They have attracted contributors from Maritime APP Store (www.themari- uct is a unique Unity plug-in confgura- technology will enables us to do in the other countries and with diferent expe- timestore.com),an online augmented/ tor, enabling us to develop high-quality years to come. But most importantly, it’s riences. ÅKP really values Fostech’s ef- mixed reality store meant for the mari- solutions at a much lower cost compared already here, and it is already making a forts within the maritime sector.” time sector, where customers can sub- to only a few months ago. In addition, diference.” … it also allows you to view inside the vessel down to the level of individual components.